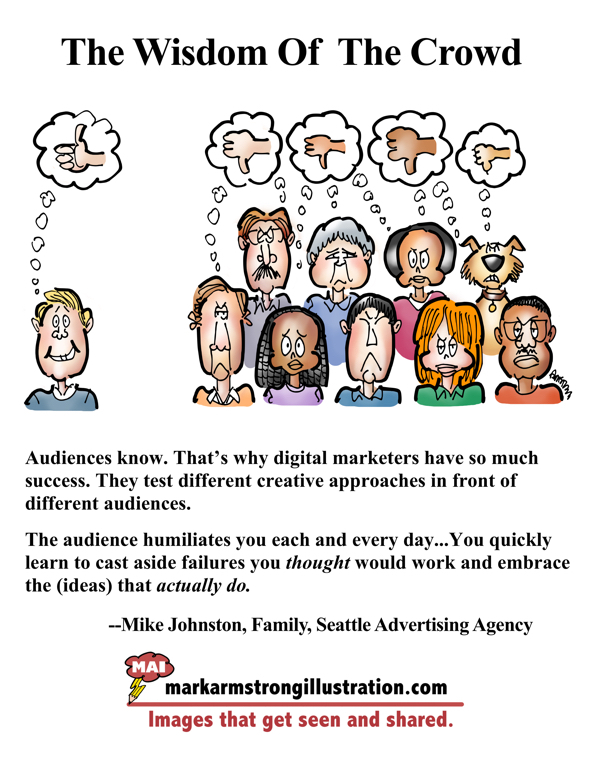 Digital marketing works because the audience humiliates you each and every day. Audiences know. That’s why digital marketers have so much success. They test different approaches in front of different audiences. The audience tells them what works best. Why test? We get too close to our own ideas. We become defensive, blind to weaknesses and potential problems. He took their advice re the opening scene of his famous film, Sunset Boulevard. 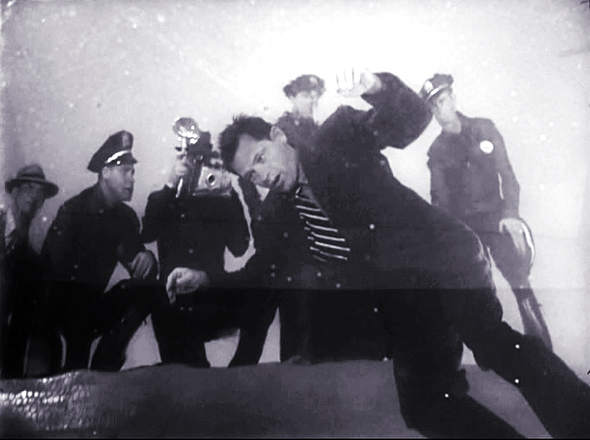 The final released version opens with William Holden’s character floating face down in a swimming pool. Wilder’s original concept was different: a city morgue scene where the corpse tells his sad story to the other dead bodies. Preview audiences roared with laughter at the scene. Wilder cut it, and opened with the body floating in the pool, with Holden doing voice-over narration to tell the story of his demise. Brands and marketing agencies use A/B testing to see which of two concepts works best. For example: which version of a web page gets more engagement. You can use the same approach for Facebook ad campaigns. But testing costs money. What if you’re a one-person shop or a small business with a limited budget? You can still experiment with different approaches on your site: different layouts and calls to action, for example. Same with content. WordPress Stats and Google Analytics are free tools that will tell you what posts are generating the most engagement. Social media platforms like Twitter also provide analytics that tell you what’s working and what’s not. So: is the crowd always right? Ah, there’s the rub. There are “rules” for every art form: writing, art, music composition, marketing– you name it. You have to know the rules, and sometimes you have to break them. 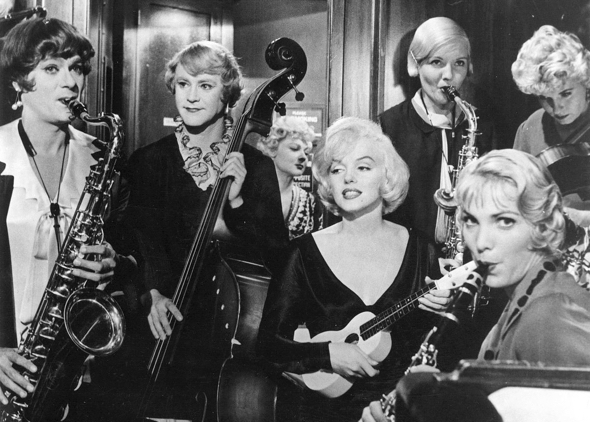 The American Film Institute ranks Some Like It Hot, starring Tony Curtis, Jack Lemmon, and Marilyn Monroe, as the greatest comedy of all time. 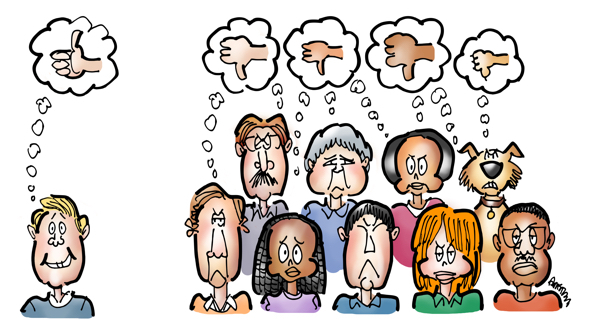 It makes sense to test your ideas against an audience. It also makes sense to trust your instincts. The two things are sometimes in conflict. I think marketers need to acknowledge that. I’m reading a book called The Power of Habit. Consumer habits are just another piece of the puzzle that can make one thing successful and the other a flop!